Why is small talk so big in America? Are you working with American colleagues, clients, partners or suppliers? 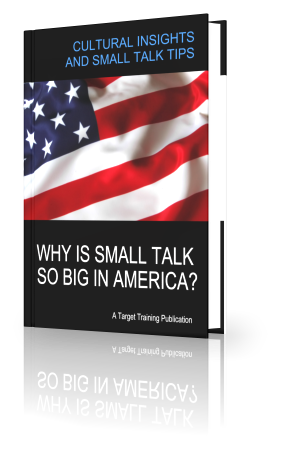 With a collection of personal perspectives, practical advice and tools, this eBook will help you develop your skill as a small talker and equally help you understand why small talk is fundamental in American business. What does ‘friend’ mean to an American? Why is small talk never a waste of time in America? What is the best question to ask to initiate small talk? With a Master of Education degree in Curriculum and Instruction and training and coaching experience since 2006, Lindsay manages the needs of the client with a balanced theoretical and practical know-how based training solution. Lindsay excels in designing inspired and meaningful hands-on material that is relevant to their evolving international business needs and requirements. She is committed to delivering participant-focused training that fosters engagement, builds strategic confidence and optimizes performance.